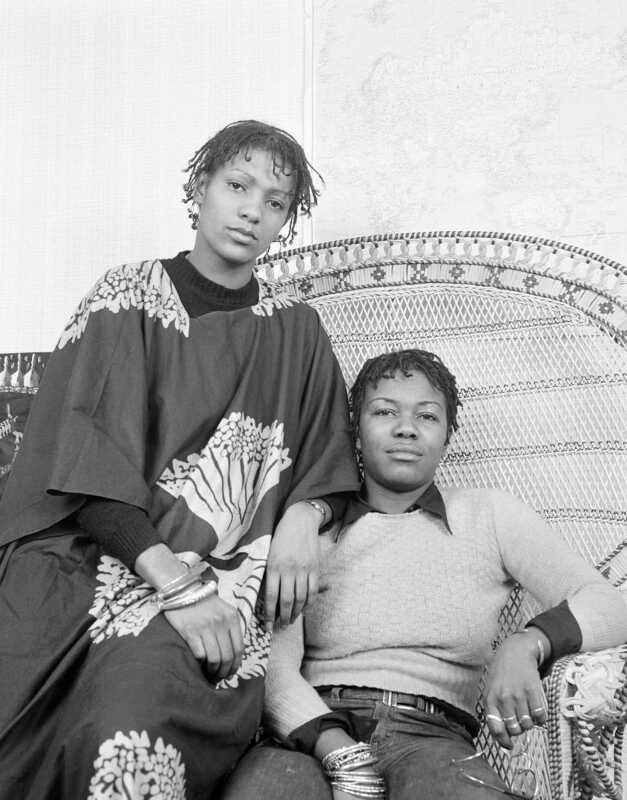 Anti-discrimination campaigner, women’s and squatter’s rights activist, Olive Morris (right) with friend Lia Obi posing in a Huey Newton, American Black Panther style chair. 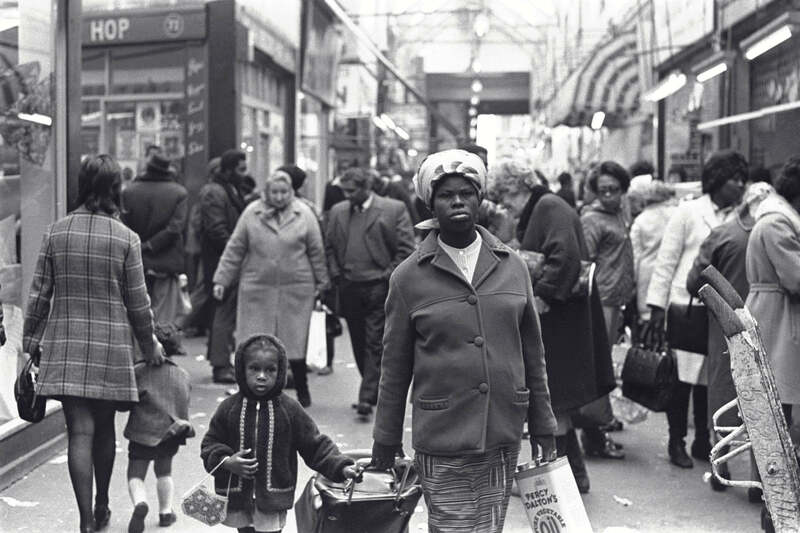 Morris was a leading member of the Brixton Black Women’s Group, Organisation of African and Asian Descent Group and the British Black Panthers. In 1986 Lambeth Council named their local authority building Olive Morris House and her image is on the Brixton Pound. Ann Wharton, Yana Francois and Veronica White, compete for The Miss West Indies crown at one of the first black beauty pageants in the Britain. The event was held at the Connaught Rooms and sponsored by the Sammy Jay movement. 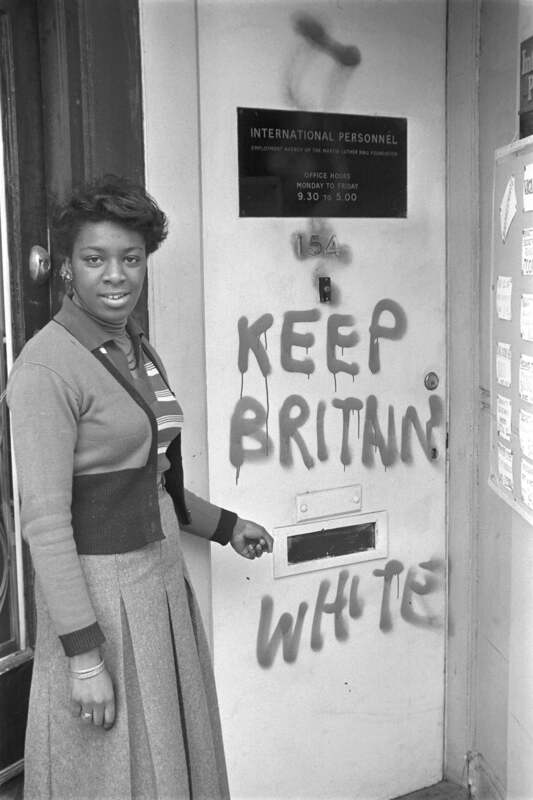 Manager of International Personnel Training Centre Barbara Grey points to ‘Keep Britain White’ graffiti drawn by the far right group National Front. The training centre was launched by the Dr Martin Luther King Foundation for young black women to learn employment skills. 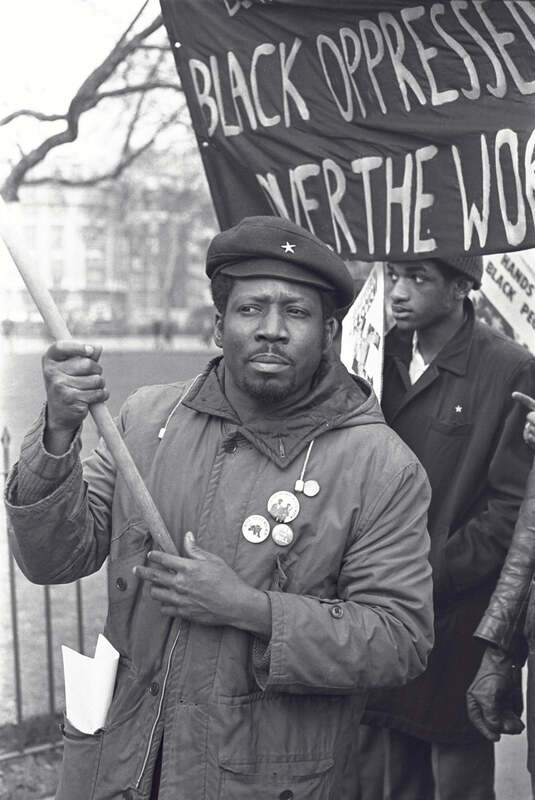 British Black Panther flag bearer known as Mackie Mackie marching at an anti-discrimination rally. This was an official duty that he carried out with pride throughout his membership of the movement. Ricky Cambridge member of The Black Unity and Freedom Party gives a lecture on black history at the Brixton Book Fair in Lambeth Town Hall. 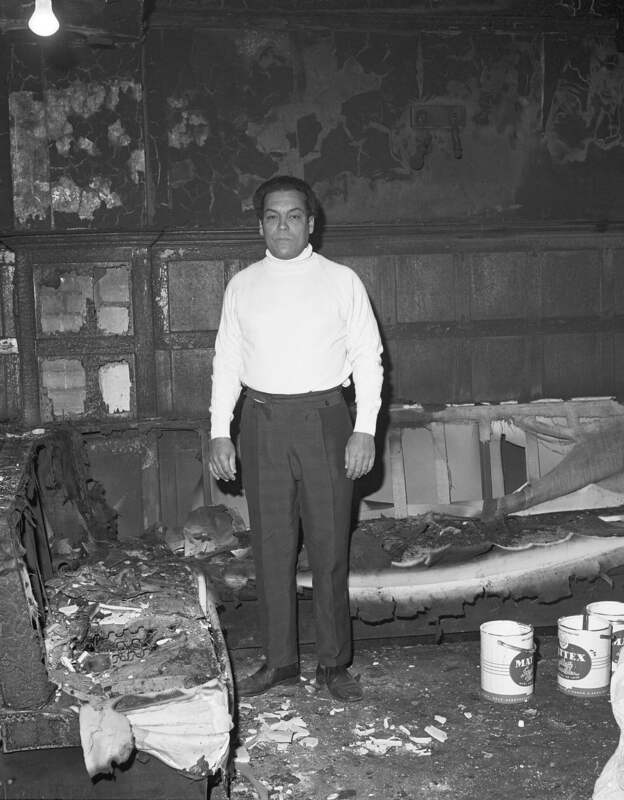 The first black British publican and licensee George Berry stands in his pub The Coach & Horses, after it was burnt down in a racist arson attack by the far right group the National Front. Courtney Laws contacted Kenlock and asked him to document the incident. Berry was awarded his Landlord licence in 1965 and trained other black people in the black community on how to gain licences. Today The Coach & Horses is known as the Market House pub. 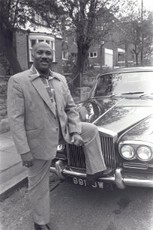 Jamaican born Joe Whitter, one of the first black millionaire property developers and philanthropists in Britain. 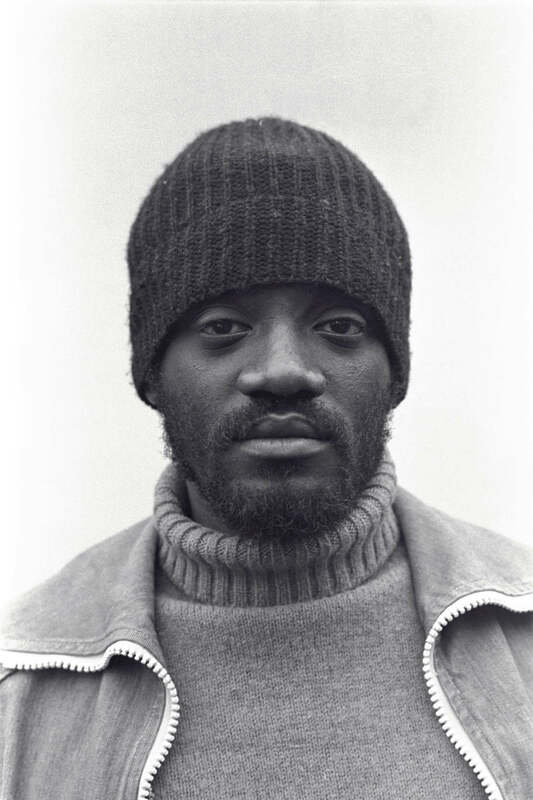 Portrait of Trinidadian writer, broadcaster and activist Darcus Howe. 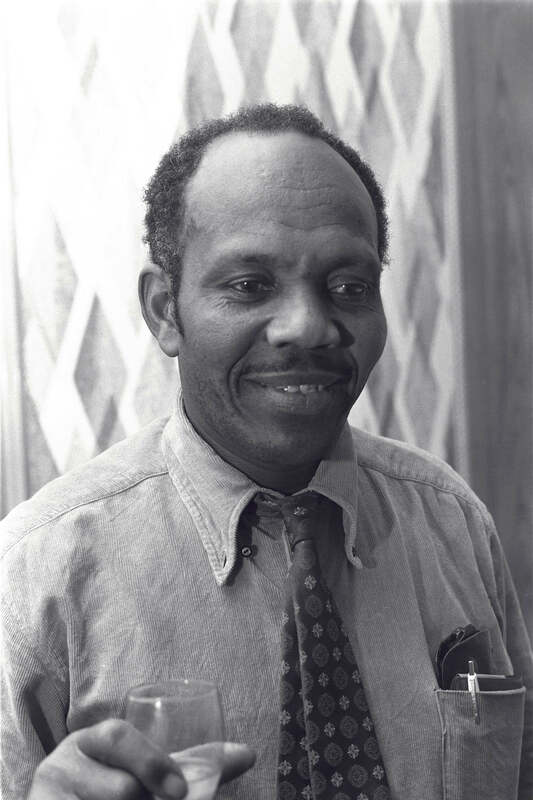 He worked for the West Indian newspaper The Hustler and in 1973 founded the black political paper Race Today. 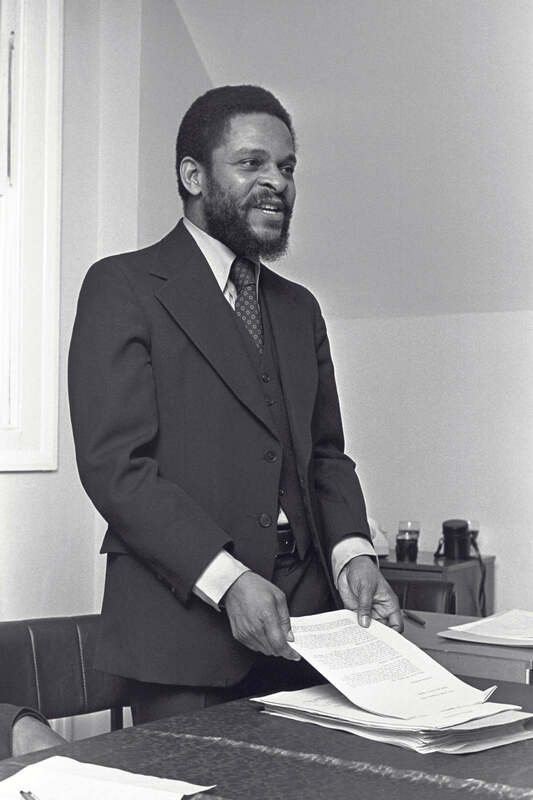 Howe led the Black People’s Day of Action in response to the New Cross Fire in 1981 and was arrested as part of the Mangrove Nine case. Portrait of Grenadian born Lord David Pitt, Baron of Hampstead at his home. Pitt was the first black person in Britain to become a parliamentary candidate, a magistrate and the chair of the Greater London Council. 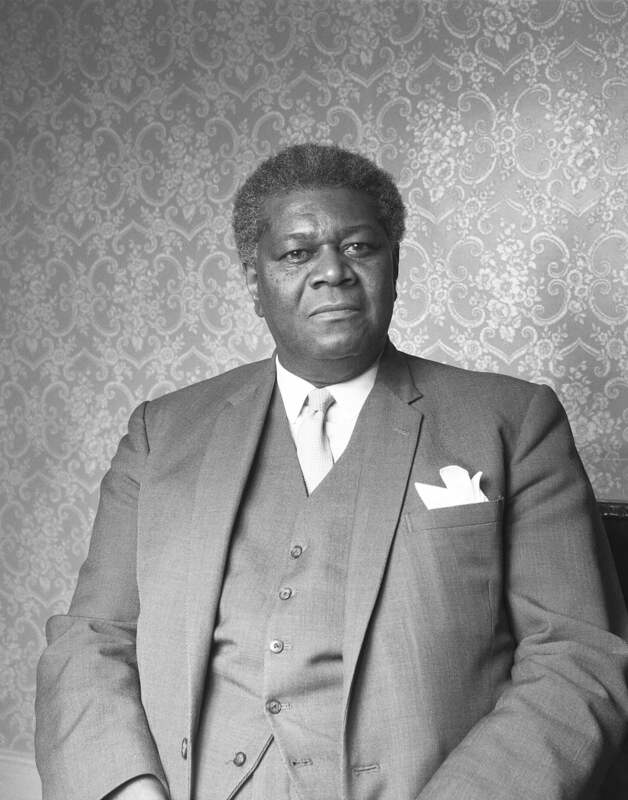 He was founder of both the West Indian National Party in 1947 and the Campaign Against Racial Discrimination in 1964, one of the first black British civil rights organisations. In 1985 he was elected President of the British Medical Association. There is a plaque at 200 North Gower Street in London where Pitt worked as a doctor from 1950 to 1984. 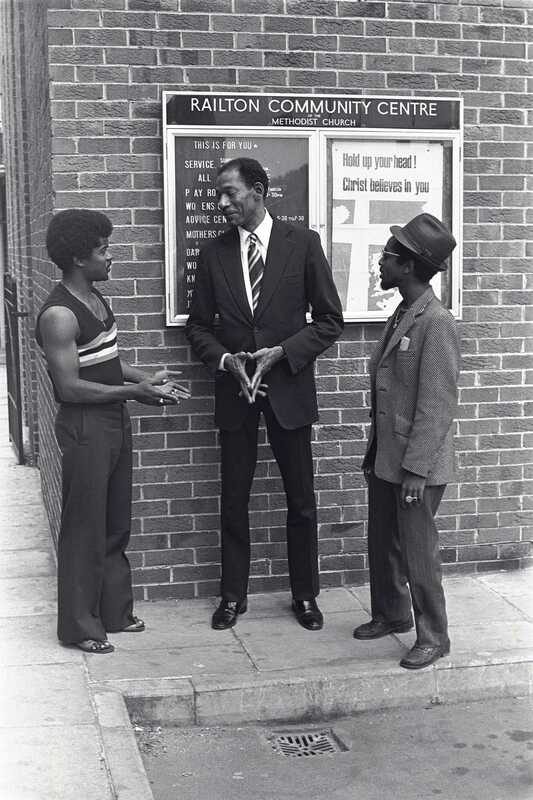 Arthur Wint OD MBE, doctor, Jamaica High Commissioner, and former Gold Olympic medalist (centre) visits the community in Brixton to inspire young people following the riots. Wint came to the Britain during the second world war and was the first Jamaican athlete to win a Gold medal in the Summer Olympics of 1948. He was a practicing surgeon and later became the Jamaica High Commissioner from 1974-1979. Tony Douglas (deputy editor) and Russell Pierre (editor) of the West Indian World, the first national black newspaper in the UK. 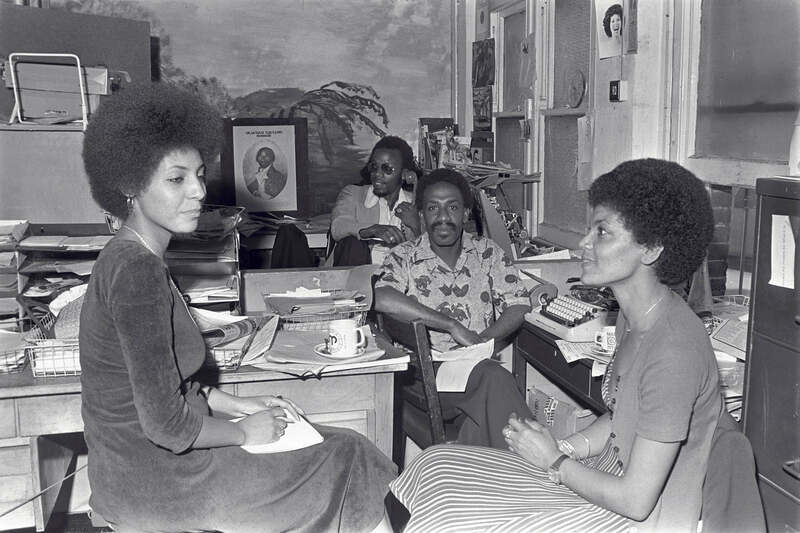 They are interviewing journalist Leila Howe Hassan (left), member of the Black Unity, Freedom Party and editor of Race Today newspaper. She sits opposite her collegue Barbara Bees (right), who was one of the Mangrove Nine and member of the British Black Panthers. 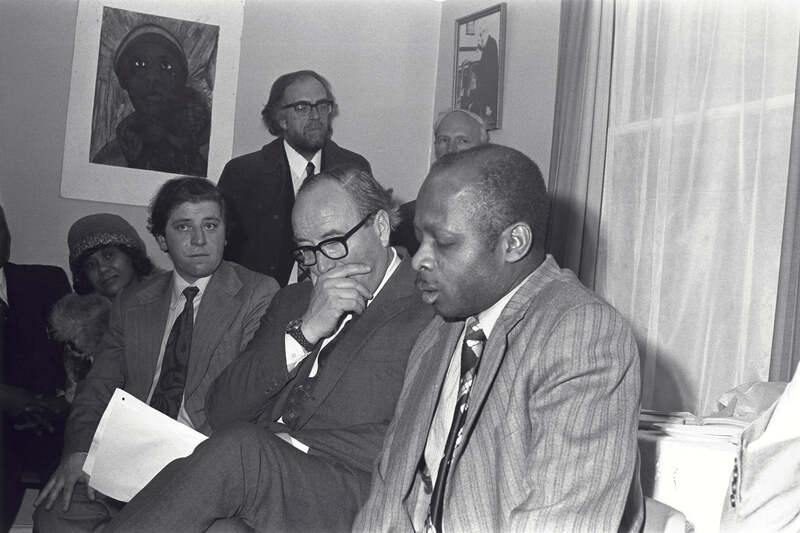 Campaigner and activist Courtney Laws (right), Director of the Brixton Neighbourhood Community Association meeting with Home Secretary Lord Roy Jenkins. The meeting was held so Jenkins could speak to prominent members of the black community about the underlying causes of crime and racial tension. Laws was commended for his work and was presented with an Order of Jamaica honour and an OBE. 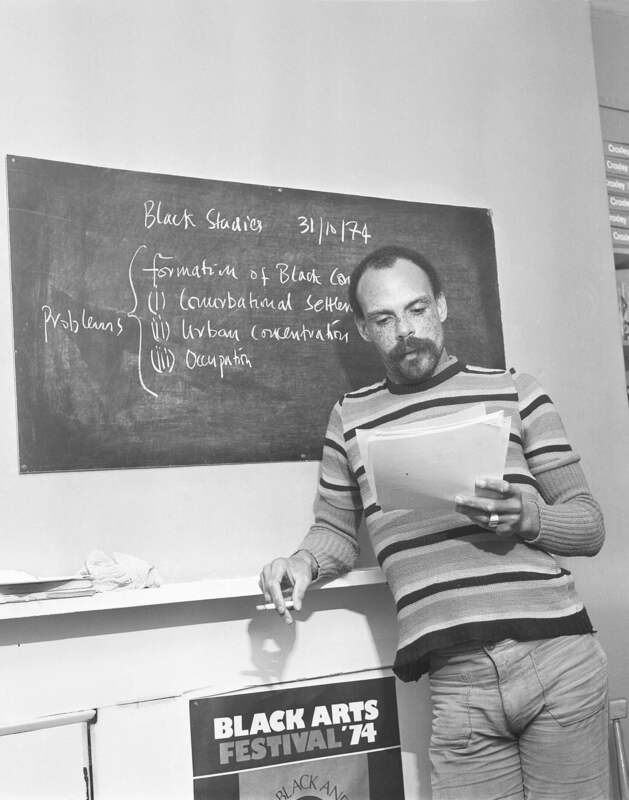 Ex-RAF serviceman, Rene Webb the Director of the Brixton Melting Pot Foundation, member of the Universal Coloured People’s Association and The Inner London Education Authority (ILEA). 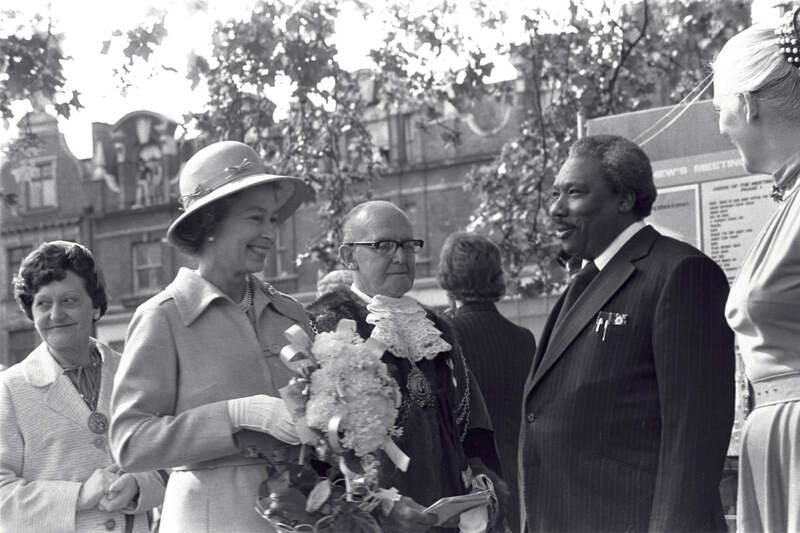 Webb received an MBE from Queen Elizabeth II at the Tate Library Garden (later renamed Windrush Square) during a Silver Jubilee celebration. Lincoln ‘Len’ Dyke of Dyke & Dryden, the first black British business to make multi-millions in the hair and beauty industry. Dyke started out as an electrician for British Rail, opened a record shop in Tottenham and then moved into hair and beauty. He later founded the West Indian Standing Conference, the Association of Jamaicans and the UK Caribbean Chamber of Commerce. Dyke &	Dryden set the blueprint for the black hair and beauty business model opening multiple hair salons across the UK and launching the annual afro hair and beauty shows. 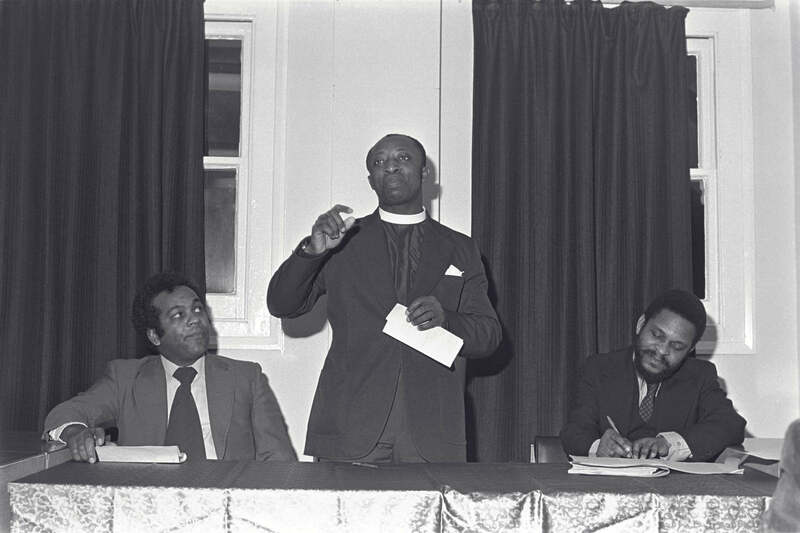 Barbadian born Wilfred Woods, anti-discrimination campaigner and first black Bishop in the Church of England (centre) speaking at a community meeting alongside David Udo (right). As an active leader in the community, Woods was a trustee of the Dr Martin Luther King Foundation and the chairman of the Institute of Race Relations. Woods became the Honorary Canon of Southwark Cathedral and the Archdeacon of Southwark. In 2000, he was awarded The Knight of St Andrew honour. 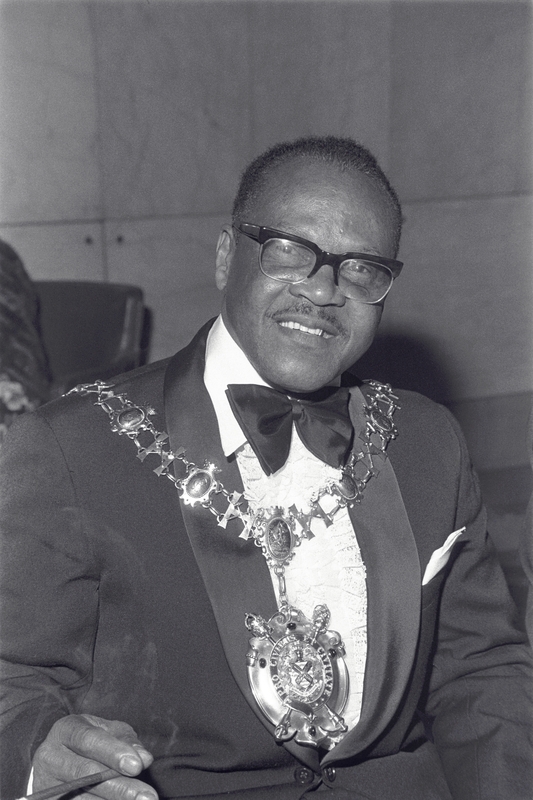 Guyanaise born Randolph Beresford was an active trade unionist and the first black mayor of the London Borough of Hammersmith and Fulham in 1975. Beresford fought for housing and accommodation rights for the black community. He led the fundraising effort to get justice for Kelso Cochrane, a young Antiguan who was murdered in a racist attack in Notting Hill in 1959. Beresford was later honoured with a British Empire Medal and a Member of the British Empire award. An education centre in White City was named The Randolph Beresford Early Years Centre in honour of the campaigner. 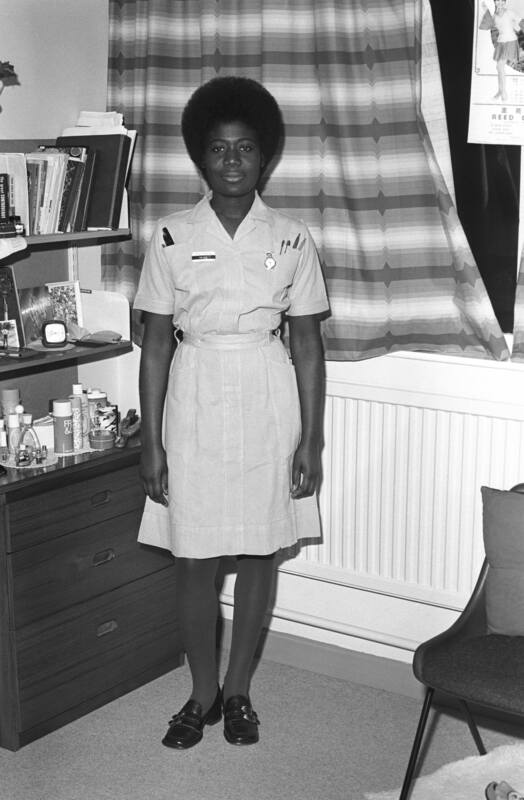 Olga Grant was one of the first black State Registered Nurses (SRN) and qualified Midwives in Luton and Dunstable Hospital. 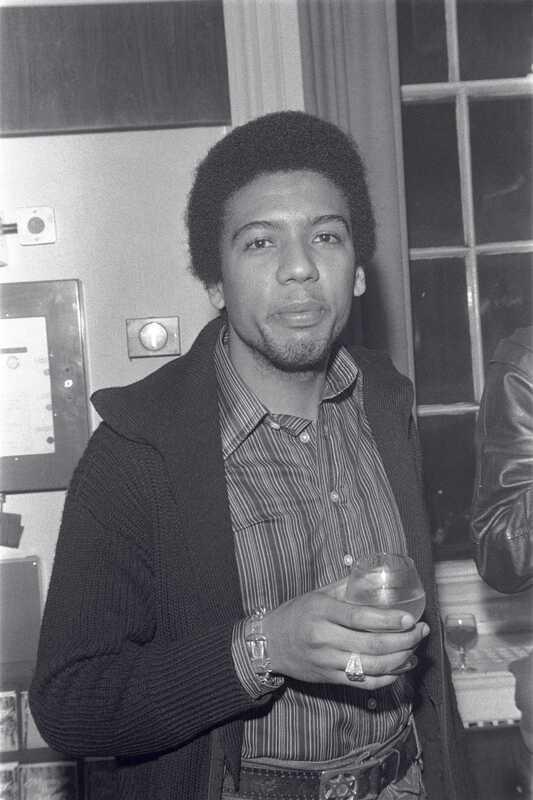 Steve Barnard was the first black DJ and presenter to play Caribbean music on mainstream radio. His show Reggae Time was pioneering for BBC London Radio. Oswald “Columbus” Manoah Denniston, owner of fabric shop Columbus & Daughters was the first Caribbean market trader in south London, after he came to Britain on the Windrush Empire ship in 1948. He became the first Windrush passenger to gain employment in the UK. Denniston was also the first black cyclist to join the Herne Hill Cycling Club in the early 1950s and founding member of the Association of Jamaicans and the Lambeth Community Relations Council, which predates the Commission for Racial Equality. Rastafarianism is both a religious and a social movement that developed in Jamaica during the 1930s. 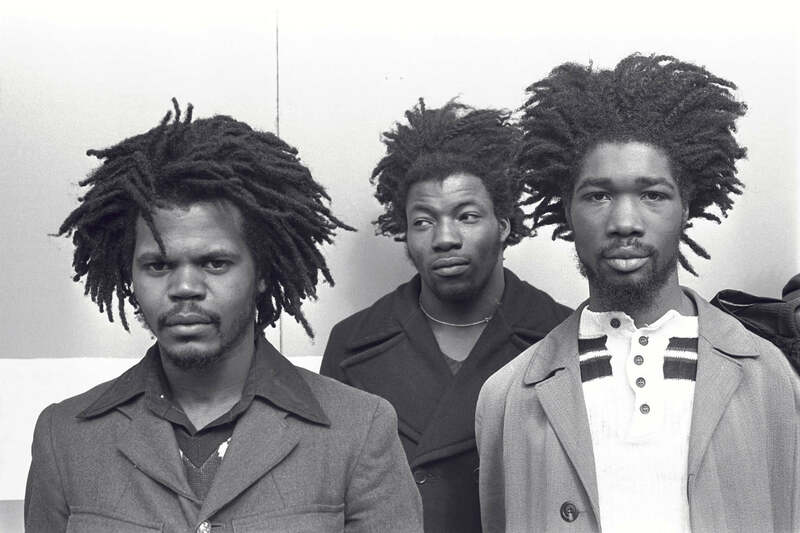 Members are often described as Rastafarians or Rastas. 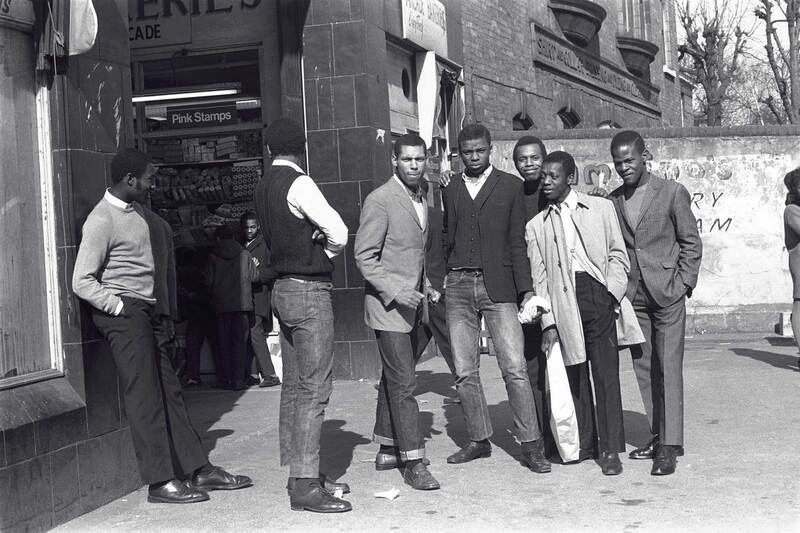 The movement had a huge impact on many areas of British culture including social politics, music and fashion since the 1970s. British Black Panther member and Director of the Southwark Diocese Race Relations Commission, David Udo gives speech at local government meeting. 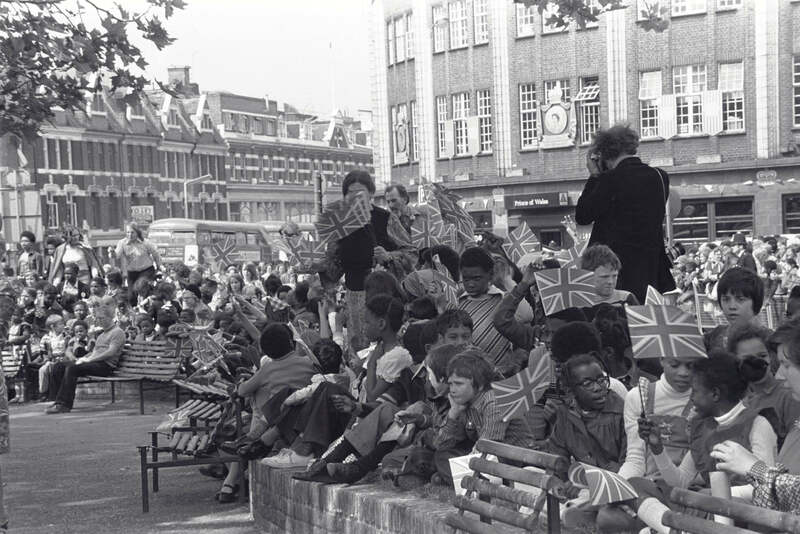 Nigerian born Udo was also the Director of the Martin Luther King Foundation in Balham where Kenlock’s famous ‘Keep Britain White’ photo was taken.